Two summers ago, I went to Rome for two weeks with one of my closest friends (& fellow Ph.D. boss babe). We had the most amazing time. Since then, I have been on a personal mission to integrate Italian life into everything, especially food. For Christmas, Nathan gave me a pasta attachment for my Kitchen Aid mixer (so really it was a gift for both of us, haha) and since then we have made delicious homemade pasta several times. I was worried that it was going to be a little above my chef’s pay grade but I was pleasantly surprised by how easy it was (the hardest part is cleaning up!). First step is to start making the sauce. 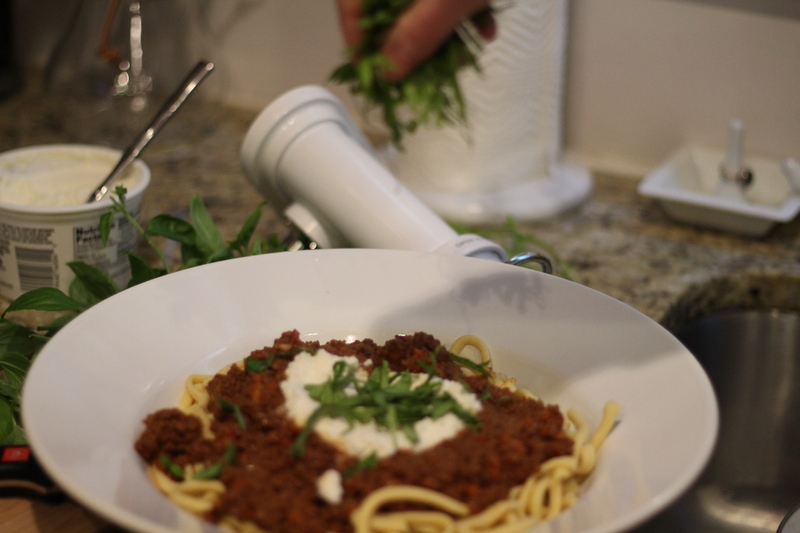 We made a homemade Bolognese, but you can make whatever sauce you want. 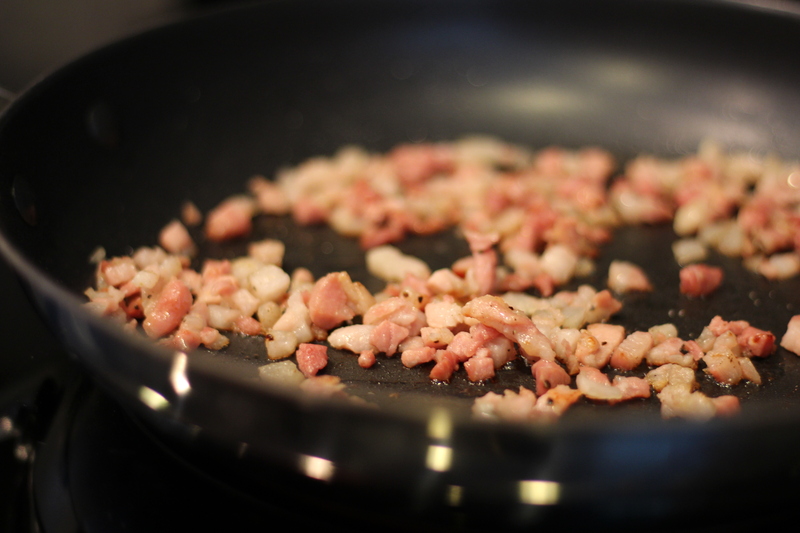 We start with pancetta and let it slowly cook on low heat. You should hear it start to sizzle quite a bit before you stir it. 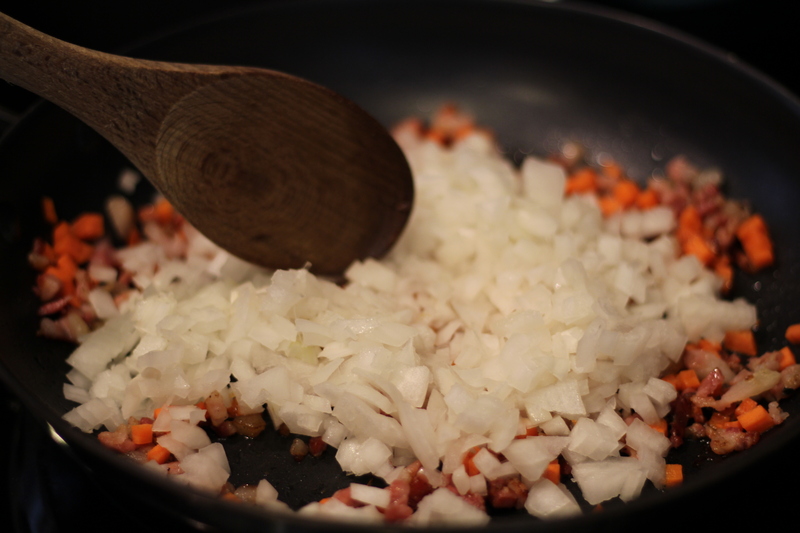 Then we add in chopped onions and carrots. Stir these ingredients together in your frying pan, but again keeping everything on low heat. While your sauce is cooking, you can start on your pasta. 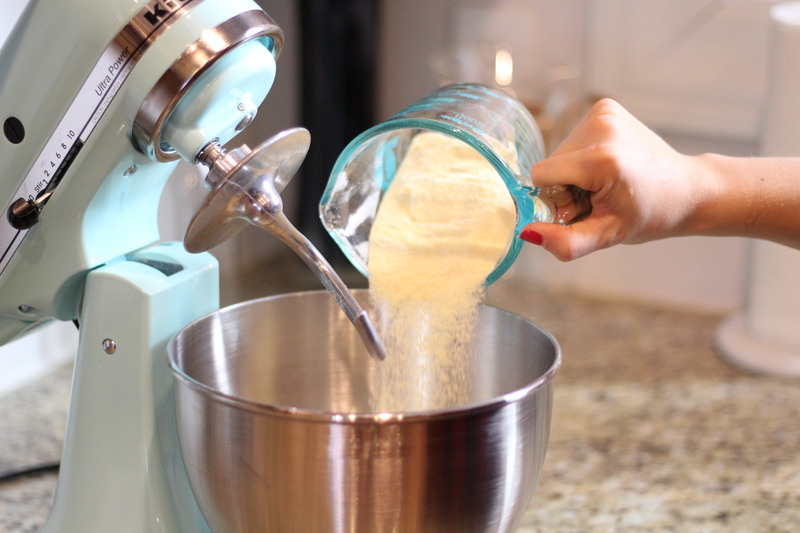 Mix both the regular flour and semolina flour together in your KitchenAid (shop here). Before adding any other ingredients, take the bowl out of the stand and stir the flours around until they are well-mixed. 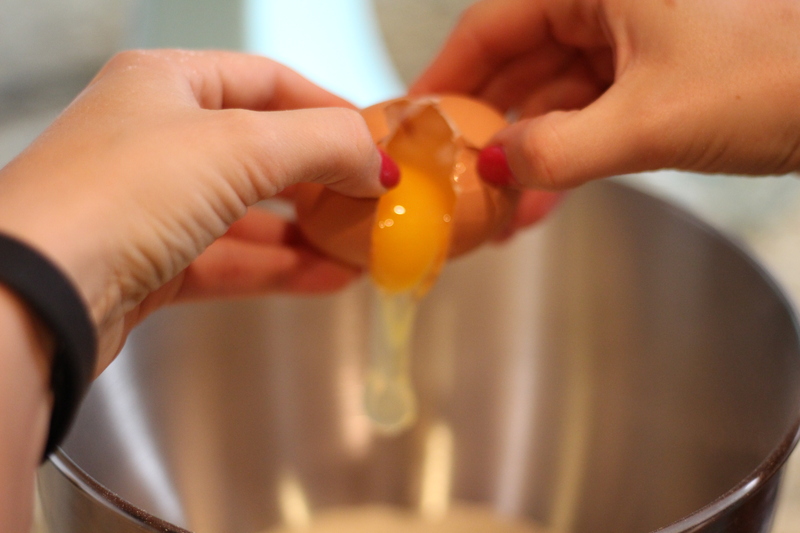 Once mixed, add your eggs and salt. 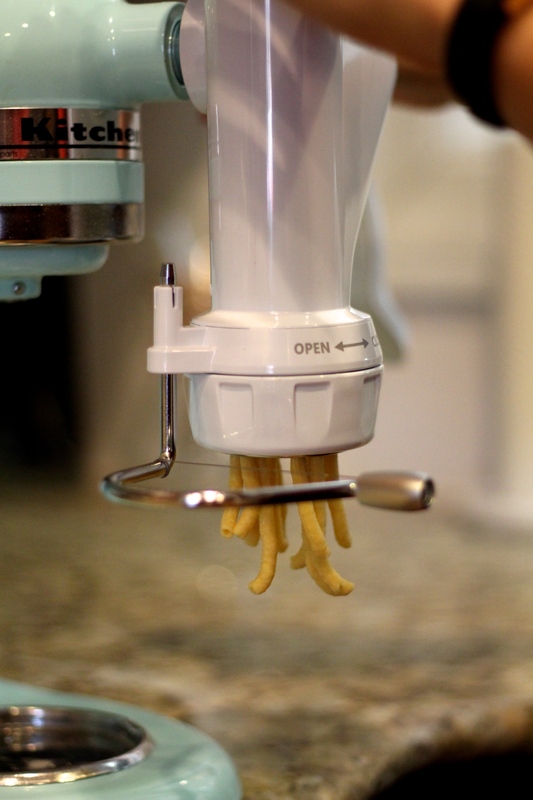 You’ll want to use the dough hook attachment for your kitchen aid. 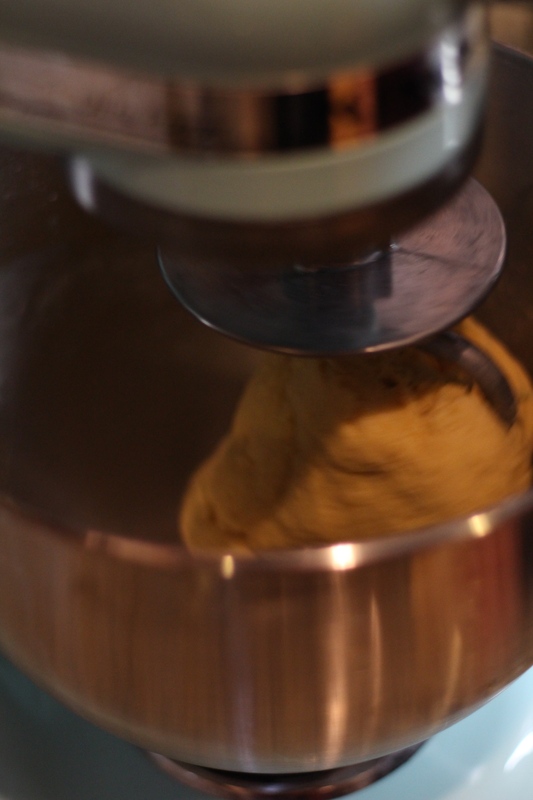 You should kneed the dough on a slow speed (maybe 2 or 4) at first just to get everything mixed together. I usually wait to add the oil until the dough is starting to take shape. 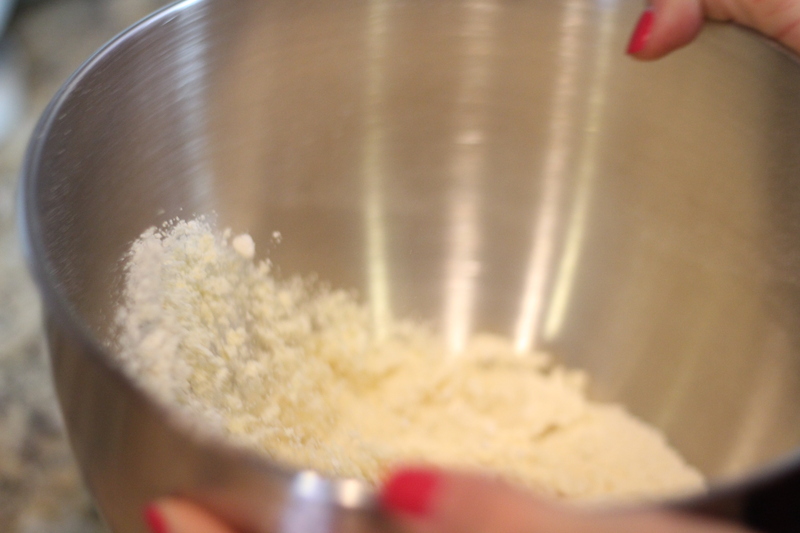 After the mixture starts to look more like dough you can turn the speed up on your mixer. 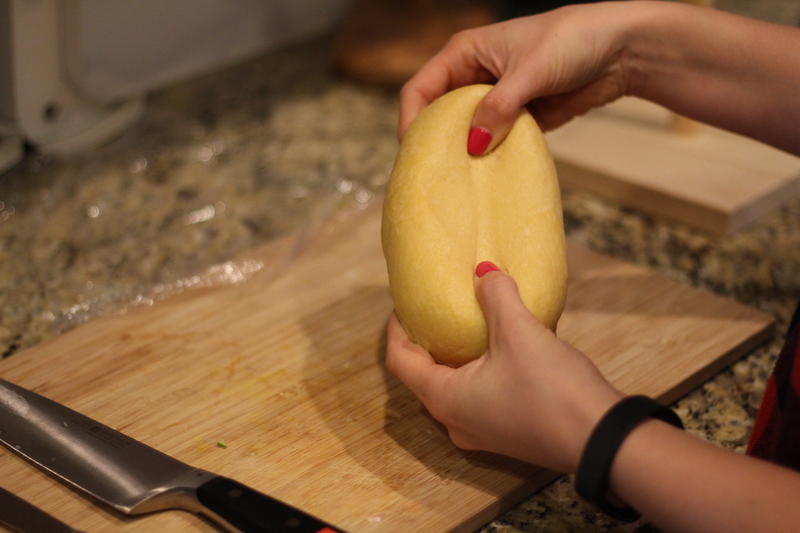 Once your dough has taken shape you’ll need to take out, wrap it in saran wrap, and place it in the fridge. Most recipes recommend leaving in the fridge for 30 minutes. 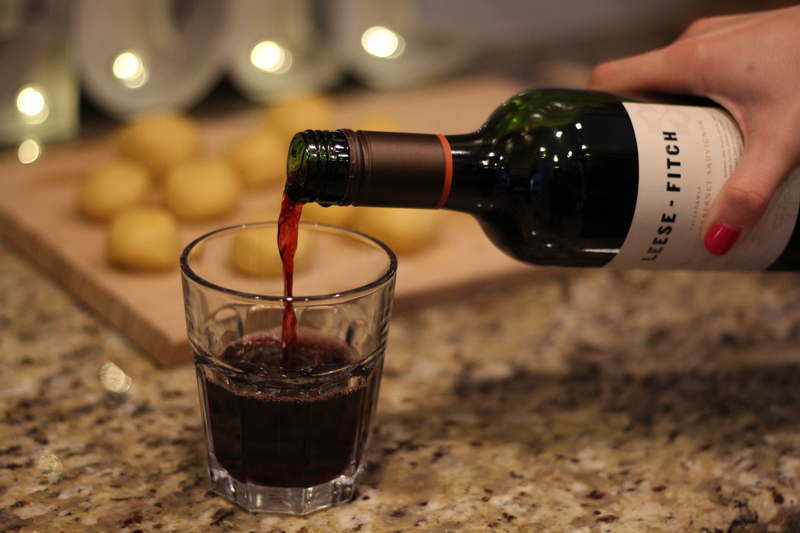 While your dough cools, and your sauce cooks, it’s a perfect time for some vino. 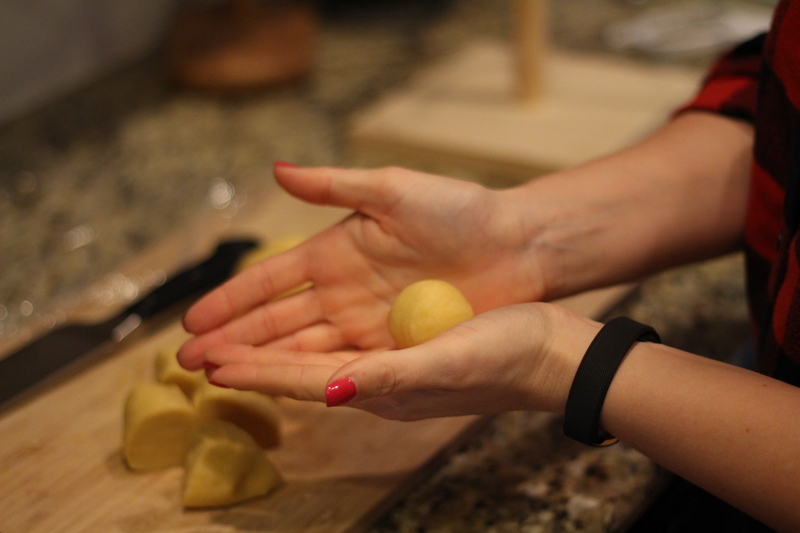 After you cut your dough into cubes you want to roll them into balls. 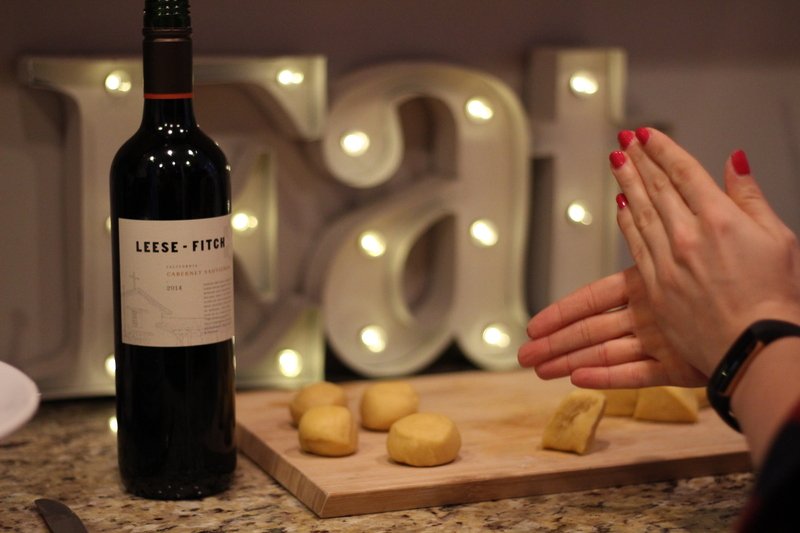 Leese-Fitch is one of our favorite wines. The cab is our personal favorite, but I’ve had a few of the other varietals and they are quite enjoyable (& at a good price point!). You’ll insert the dough into the top of the pasta maker. I usually put 2-3 in at one time. You’ll then use the attachment to push the pieces through. This is an iterative process, in that you are continually feeding more dough into the maker so that the pasta can continue to be produced at the bottom. 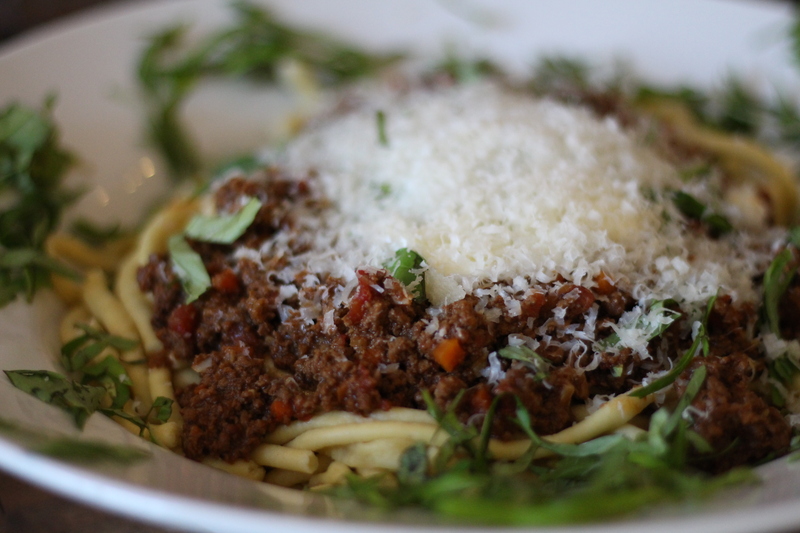 Now, this is bucatini pasta, which is a thicker style pasta with a hallow center. This KitchenAid attachment has 6 different pasta shapers, including macaroni and spaghetti (shop here). 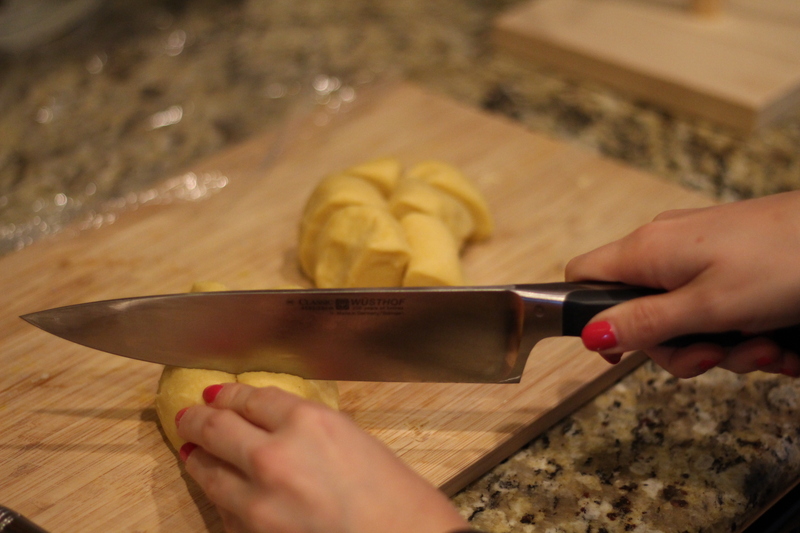 When you feel like your pasta has reached a desired length you’ll use the cutter at the bottom to slice the pasta. 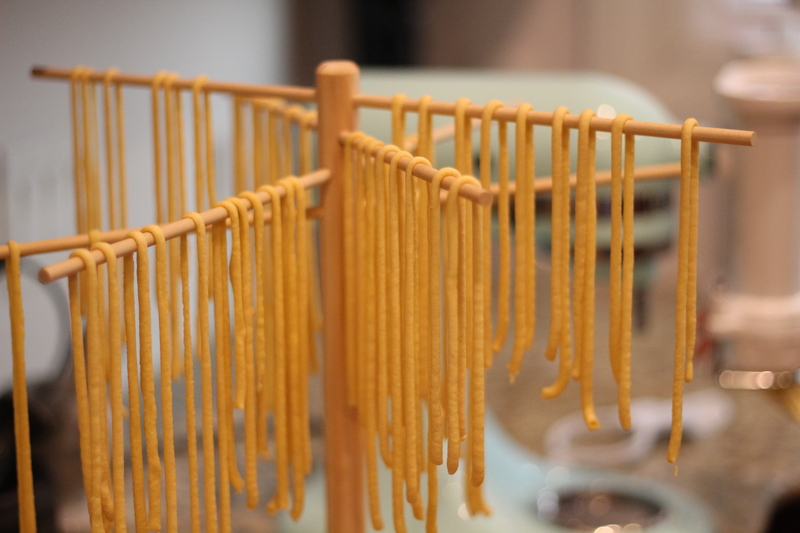 We use a pasta drying rack (shop here), but you don’t have to. 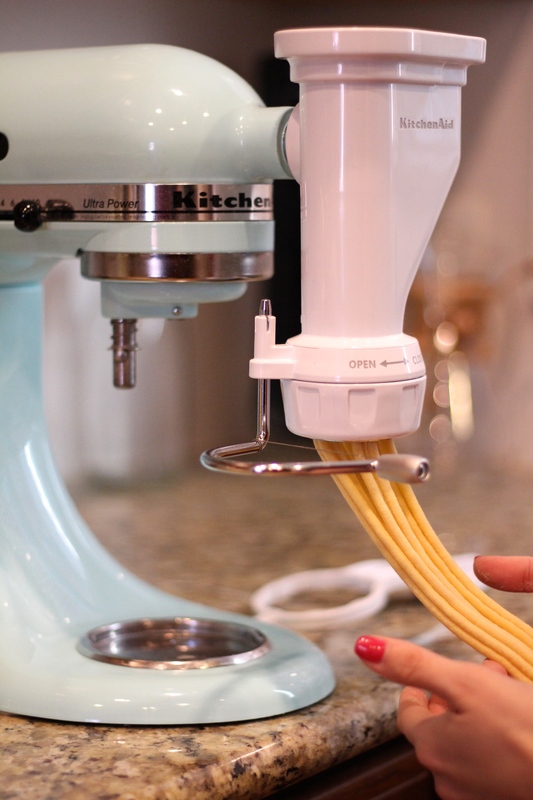 We find this is the best way to keep the pasta from sticking. 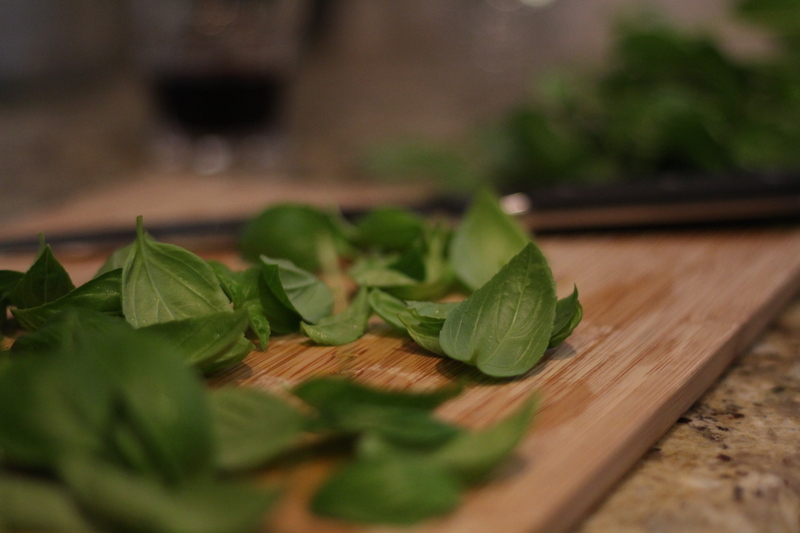 Fresh cut basil, is a must! 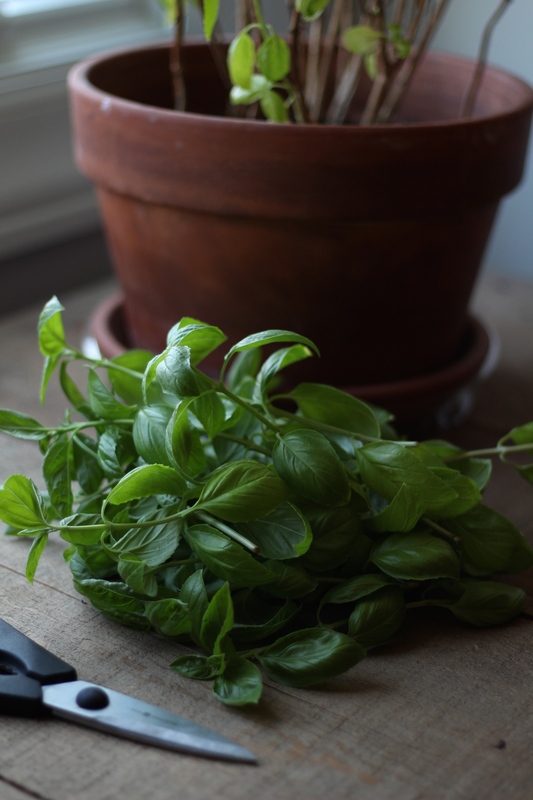 We have a rather large basil plant in our house (Nathan calls it a basil bush, ha) so we are never low on fresh basil. Once you are finished shaping the pasta, it needs to boil for only a few minutes. Be sure to salt the water! In terms of cooking time, we usually just eyeball it. Once the pasta starts to float, take a piece out, taste it and see how you like the texture. Al dente should be a the firmer side. Drain the water and place in a large bowl. We then take our sauce that has been simmering this entire time (ps. this sauce will make your entire house smell absolutely heavenly) and spoon some on top of our pasta. We like to add ricotta and some of that fresh basil. 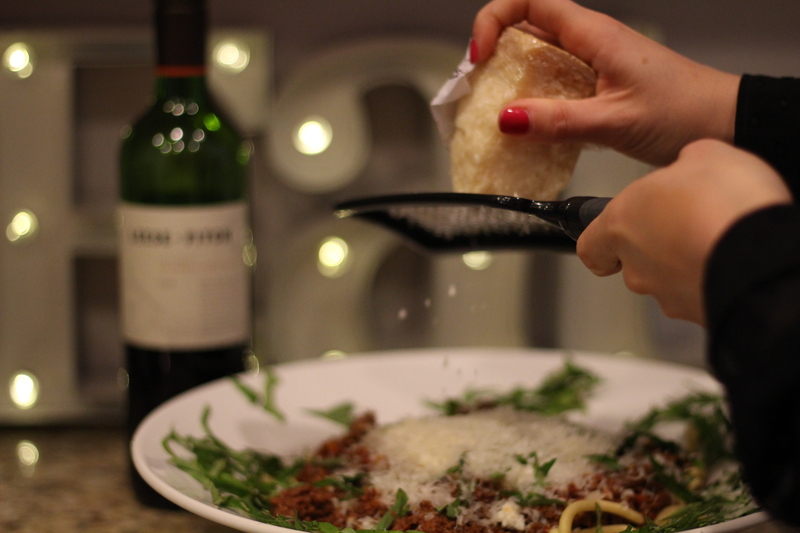 And some freshly grated parmesan to top it off (because we need all the cheese). 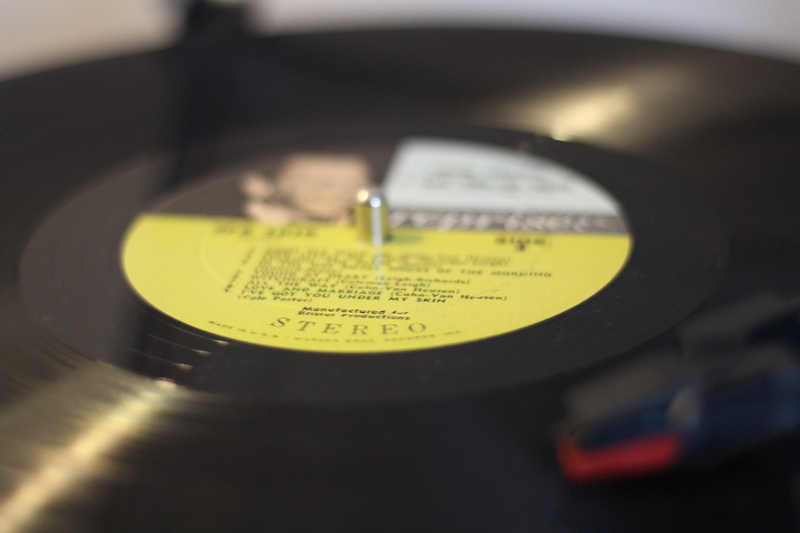 Put on some tunes (we were in a classic Frank Sinata mood) and enjoy! Buon Appetito! 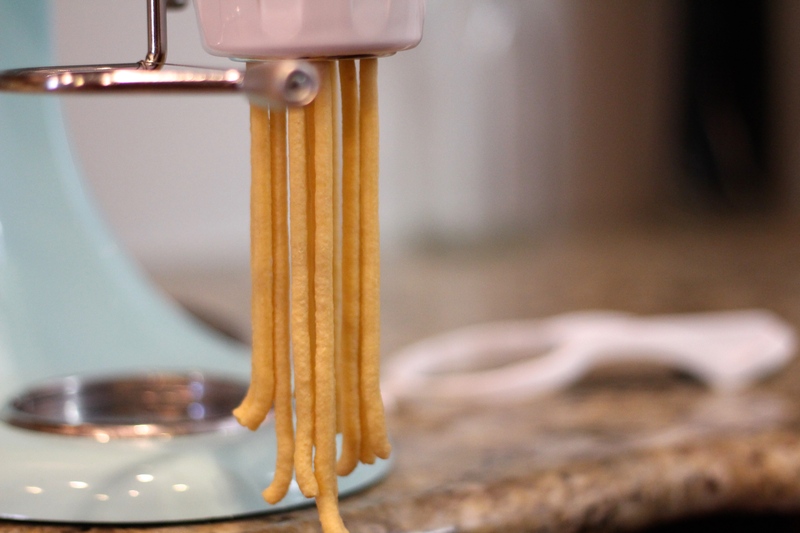 Have you ever made homemade pasta before? 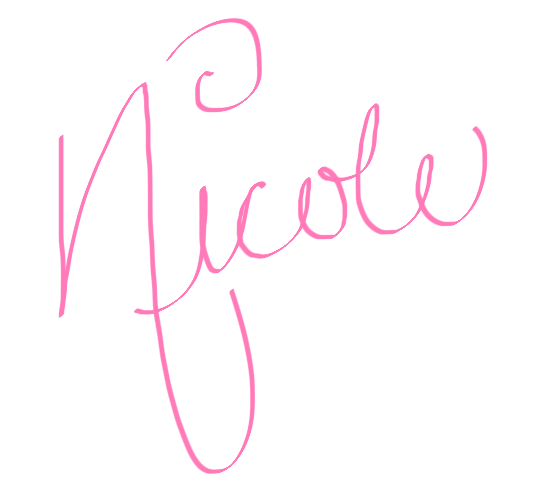 Have any tips or tricks? Comment below!